The Paul Klee Foundation, ed., Paul Klee: Catalogue Raisonné, vol. V, 1927-1930, Bern, 2001, no. 5288, p. 493 (illustrated). Working in drawing almost exclusively until 1914, Klee was a master of works on paper. Klee’s lively drawings and prints elicited unexpected responses from his viewers. Many of Klee’s drawings were improvisational and vivified by his signature energetic and thin line. Acting as an instrument of precision, Klee used his line to describe form and used his inks to reveal the delicate quality of paper. 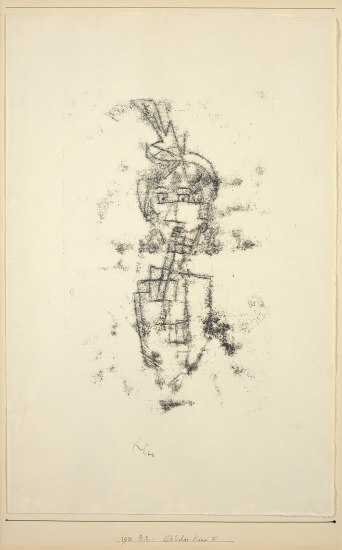 For this carbon transfer, Klee drew with a needle over an inked surface; the page received the image below as well as any ink transferred by the pressure of the artist’s hand. Carbon transfer was a technically ingenious and autographic method of drawing. Even though Klee’s hand remained invisible, it could be felt palpably pulsating through every inch of this 1930 drawing. Carbon drawing, on laid paper watermark MBM, mounted to card by the artist. Signed on the drawing and dated, annotated and titled on the mount '1930 B. 2. ältliches Kind II' in ink, framed.